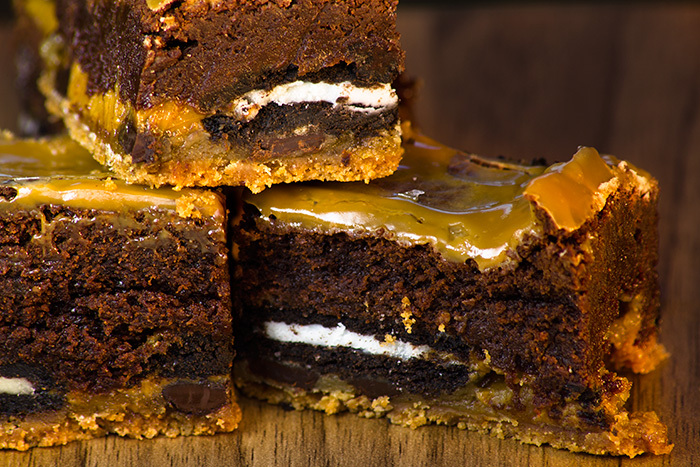 Layers of Chocolate Chip Cookies, Oreos, Caramel sauce and Brownie! 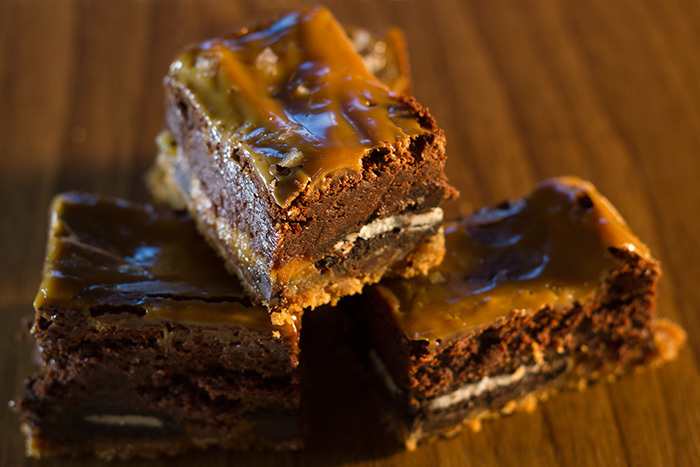 I believe Slutty Brownies gained their name because they are ‘filthy and indulgent’! Oh yes….they are most definitely slutty!! I made these mid week as a treat for my husband. He is a big fan of the chocolate brownie so I thought I would add a little (ok… a lot!) extra. If I give you one tip on these it would be to WAIT. Honestly. They get so much better with time. I ate them the night they were cooked and they looked undercooked and didn’t taste that great. So much so that I didn’t want anyone else to try them I was so disappointed with them. But when I tried them again the next day (I’m not one to give up easily) they were brilliant. I baked them on Thursday night and having just had another block I can honestly say they have matured well. They no longer taste undercooked. They are squidgy and moist – just like a brownie should be. Once melted, add the sugar and cocoa powder. Add the salt, vanilla and eggs to the batter and then whisk until combined. In a separate bowl, sift the flour and then slowly incorporate the flour into the batter until it’s all mixed. In a large bowl, cream together the butter and sugars with a hand mixer. Add the eggs one at a time and then the vanilla, scraping down the sides of the mixing bowl as you go. Add the flour, salt, baking soda and baking powder and mix on low until incorporated. Fold in the chocolate chips and then set aside. Line the bottom of an 8×8 baking pan with tin foil and then spray the foil liberally with baking spray. Remove the lid on the caramel sauce/dulce de leche and microwave for 35 seconds (until it becomes slightly warm and spreadable). Use a spoon to drizzle the caramel over the Oreos. 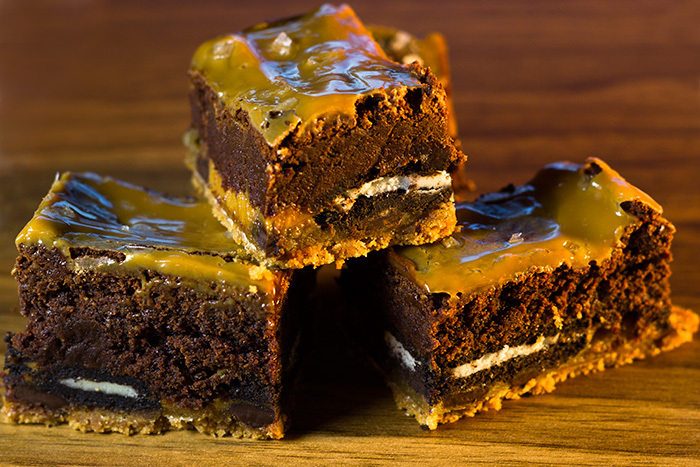 Lastly: Pour the brownie batter on top of the caramel-Oreo layer. Use a spatula to make sure it’s even. Bake for 30-35 minutes. Test with a knife to see if the centre is done. It’s OK if the knife has some brownie on it. It’s easy to over-bake the cookie layer if left in the oven too long. To be honest, you only need a square half the size of that shown in my photo. They would be amazing warmed up and served with ice cream! And if you don’t like salted caramel you can always leave the caramel layers out of the recipe.